Gustav Peter Ratzlaff: pastor, machinist, farmer; born 3 Sept. 1892 in Wymyschle, Poland, to Peter and Wilhelmina (Prachnau) Ratzlaff, second of three sons and one daughter. In 1918 he married Maria Janzen in Millerowo, Russia. They had seven children. He died 25 August 1985 in Abbotsford, British Columbia (BC), Canada. Gustav Ratzlaff was baptized in 1904 in the Wymyschle Mennonite Brethren (MB) Church. In 1909 he moved to Millerowo, Russia and apprenticed as a machinist in the factory of Martens, De Fehr and Dyck, who sent him on a two-year training course to a technical school in Hilsburghauser, Germany. During World War I he worked as an orderly in the Russian army. After the war, he continued to work at the factory until 1923 when he returned to Poland, where he farmed and was part owner of a sawmill. In Poland he was ordained as pastor in the Wymyschle MB Church in 1931. With the advance of the Russian army in 1945, the family fled to Germany where Gustav ministered in the Gronau refugee camp. Four years later (1949) they immigrated to Alberta, where he became a preacher in the Linden Mennonite Brethren Church. In 1952, they bought a small farm in Arnold, BC where he was very active in church work, becoming the leading pastor from 1956-1964. Except for a small stipend he received during the last two years, this work was unpaid. To support his family he worked on a berry and nut farm, in addition to managing his own farm. 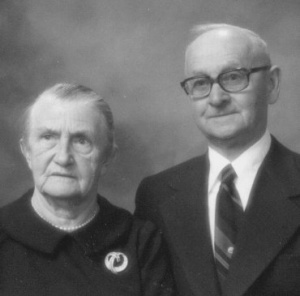 Gustav brought along some original church records from Poland, and was therefore able to assist people in creating birth and baptismal certificates that were later recognized by the Canadian government. Gustav relied on his wife to run the farm, raise the children and act as hostess, while he immersed himself in the life of the village--preaching, officiating at weddings and funerals, counseling and settling conflicts. His ministry had a long-term impact. He was able to draw the community together by being adaptable, caring, and listening to all sides of a conflict. He was trusted and never uttered a harsh word. Some of his most trying encounters included settling matters of church discipline and negotiating the very difficult transition from German to English as the language of communication in church life. Gustav rode his bike to all meetings and took the train to conferences in other provinces. He learned to speak loudly because there were no public address systems. All who knew him remember a man who had a heart for people and a vision for a loving community. His life was absorbed with shepherding his flock. Family records, personal papers and a church directory for the Wymschyle Mennonite Brethren Church which are kept at the home of Herb Ratzlaff. Pauls, Helen Rose. "Ratzlaff, Gustav (1892-1985)." Global Anabaptist Mennonite Encyclopedia Online. January 2002. Web. 23 Apr 2019. http://gameo.org/index.php?title=Ratzlaff,_Gustav_(1892-1985)&oldid=148902. Pauls, Helen Rose. (January 2002). Ratzlaff, Gustav (1892-1985). Global Anabaptist Mennonite Encyclopedia Online. Retrieved 23 April 2019, from http://gameo.org/index.php?title=Ratzlaff,_Gustav_(1892-1985)&oldid=148902. This page was last modified on 13 June 2017, at 18:13.